While I've been camping for years, I've only been backpacking for a short time. I'm trying to find the right equipment, alternating between tent and hammock. My dog usually comes along on the longer hikes, and my wife and toddler join me on the shorter ones. I tend to carry more gear than I need resulting in a heavier pack, but I'm working on that. When I hike with my dog and/or my wife and son, we take it a bit slower, stopping frequently to enjoy the forest. I rarely hike fast unless I'm trying to make up time. My first impression of this dry sack was that it felt rugged. The material has a heavy duty feel to it and the seams have excellent stitching and taping. The lash loops are a great idea but look fairly thin - I'll be interested in seeing how they hold up with heavier contents in the sack. The first thing I checked after opening the bag were the measurements. I checked the volume by filling the bag with water and then pouring out a bit at a time until I could close the bag following the manufacturer's directions to fold the top three times before clipping the attachments together. I found that the sack held closer to 12.5 L rather than the full 13 L listed in the measurements. After leaving it filled with water for an hour I checked for any water leaking out and didn't find anything. I thought at first that the 13 L sack was an awkward size (too small to hold larger items like a sleeping bag and too big to just hold miscellaneous small items) but it held my sleeping bag easily and, in a second test, it also was able to hold all the extra clothing I'd take on a three night trip. I was also able to compress the contents down more that I had expected - possibly because the sack seems pretty heavy duty and I wasn't afraid of tearing anything while compressing it. The lash points look very useful and I'll be interested to see if they, along with the D-rings, can allow the dry sack to function as a food bag overnight so I don't have to worry about my food getting wet when hanging from a tree. 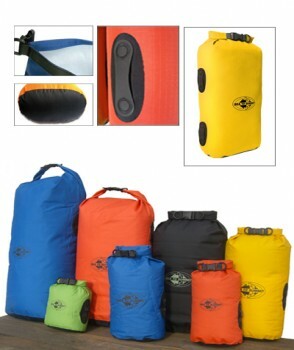 I will also try to see if they can support the sack if I hang it full of water to allow for in-camp filtering. I've been able to get this dry sack out on two short backpacking trips in Raccoon Creek State Park. Both trips were one night, covered around 6 miles (9.5 km) round trip, and had temperatures in the low 40s F (around 5 C) with light snow flurries and misty rain. I had expected the weather to be significantly colder and to only snow, not rain. So I was very happy to have this dry sack along. I used it primarily to keep my sleeping bag and a change of clothing dry and it worked very well at that task. When compressed and the top rolled down and secured, it fit quite well in the bottom of my backpack. While in camp, I unpacked my sleeping bag and clothing and used the bag to hold water that I scooped out of the lake. The D-rings on the side made it very easy to suspend the bag from a branch and filter water from it as I needed it. It was nice not having to go back to the lake to filter water. The D-rings also came in handy when I used the dry sack as a food bag overnight. Putting a few rocks in the bottom, rolling the top closed, and attaching the rope to the D-rings made it pretty easy to toss over a branch. It kept my food, stove, and cooking gear dry at night. I made it down to the beach for a week in April, just outside of Charleston, South Carolina, and was able to get quite a bit use out of this dry sack. Two nights camping on the beach in 70 F (21 C) weather and a sailing trip, on rougher seas than were expected, really let me put the sack through its paces. One of the nights on the beach had perfect weather with no rain at all while the other had scattered showers that would last for a few minutes before moving on. Additionally, I got out for a more normal, two-night backpacking trip in Raccoon Creek State Park with temps in the 60s F (15 - 20 C) with one small rainstorm while I was hiking. While camping on the beach, I had to deal with quite a bit of sand blowing around and my tarp, which may have protected my hammock from the rain, didn't protect anything beneath my hammock from the sand. I kept my cooking gear and food inside the sack and hung it from one of the straps I use to hang my hammock. It hung low enough to rest on the ground and when I woke each morning, a small sand dune had formed around it. I was grateful that the dry sack worked well enough to keep the sand out. The second night had the addition of several scattered showers which, when combined with the sand, really made a mess of the gear I had on the ground but did not affect anything inside the dry sack. I was also able to use the dry sack while sailing around Charleston. I kept everyone's car keys, wallets, and cell phones inside the bag and sealed it up. I left a decent amount of air inside to help the bag float in case it went overboard but, fortunately, that didn't happen. The seas got a bit rougher than expected and we got quite a bit of spray during the trip but everything stayed dry inside the sack. The trip to Raccoon Creek was a pleasant, two day and night trip. I did get caught in one brief rainstorm while hiking and I was glad that my sleeping bag and clothing were packed inside the dry sack. I also discovered that the dry sack can function reasonably well as a pillow! Since it was warmer out, I didn't have an extra fleece jacket to ball up and use as a pillow so I sealed up the dry sack and left some air inside. I then stuffed it inside one of my extra shirts to make it a little softer. I also ran a small piece of cord through the tie-out and clipped it to the upper/head end of my hammock - this kept the sack in place all night long. It was a little large to be totally comfortable, but it was certainly better than nothing! This concludes my Report on the Sea to Summit Big River Dry Sack. Thanks to BackpackGearTest.org and Sea to Summit for this opportunity.